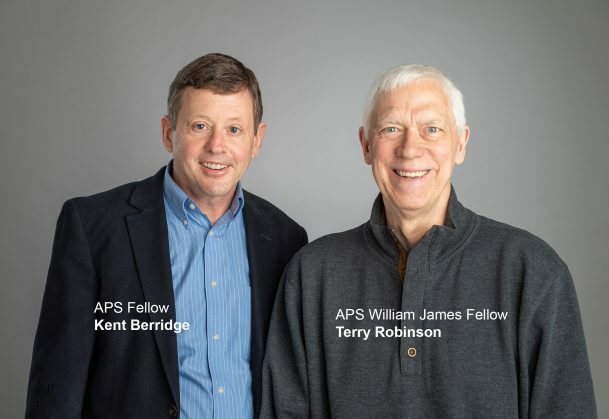 APS William James Fellow Terry Robinson and APS Fellow Kent Berridge of the University of Michigan have won the 2019 University of Louisville Grawemeyer Award For Psychology for their research on the role of neural sensitization in drug addiction. Robinson and Berridge’s Incentive-Sensitization Theory of Addiction focuses on how our brains process “liking” verses “wanting.” The theory suggests that the dopamine system in the brains of people struggling with addiction may become hypersensitive to drugs and drug-related cues, producing an excessive desire for drugs that can last for years to come. This sensitization effect can make it difficult for individuals to resist drug-use even when they are actively attempting to avoid them. When Robinson and Berridge first published this theory in 1993, it ran contrary to all thinking about pleasure systems in the brain, said award director Woody Petry in a press release. Since then, the theory has been supported by numerous studies and the original paper has been cited over 6,500 times. Robinson spoke about the implications of individual variation in resisting temptation for our understanding of addiction during his William James Fellow Award address at the 2014 APS Annual Convention in San Francisco. Robinson and Berridge have also been elected fellows of the American Association for the Advancement of Science, and have received other distinguished prizes. Grawemeyer Award winners receive a $100,000 prize and are scheduled to present free lectures on outstanding works in the fields of music, international relations, psychology, and more this upcoming April in Louisville, Kentucky.